Guess where I just got back from by the photo directly below. Yes, it was Makapu. 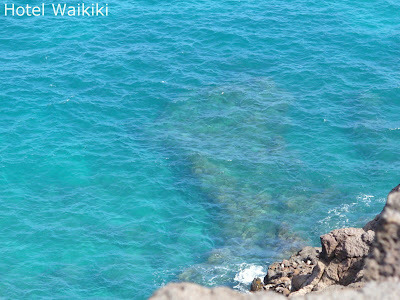 The water is not that pristine in Waikiki with all the suntan lotion that gets washed off the bathers. Of course, you already knew that. Photos taken with my 4-megapixel camera. That camera is much easier to lug around and takes just as good pictures as my $400 Canon. Plus, I rode Iron Horse (Honda Shadow 600) out to Makapu. Iron Horse has throw-over type saddlebags, and things get bounced around a lot in those type of saddlebags. I was talking to a paraglider in the lookout's parking lot who happened to be waiting on some passengers to show up. Hillary Clinton? Perhaps. She's in town. Perfect wind speeds today for paragliding. Clear day, too. If the winds are too brisky, it would only make for a bumping ride, especially with a passenger clinging for his or her life on board the same paraglider. I believe the paraglider was Brazilian. I'll say this that there is definitely a genuine sense of enthusiasm with those involved with paragliding. When you think about it, why would it be otherwise. Taking flight, and all that. Those are really nice photos. I love that first one. I've never been in water that clear before. Brad- the top photo is taken from about 200-ft. elevation which gives you an idea of how better the water is when you get away from the urban areas. 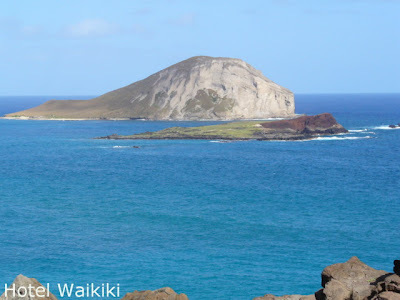 Plus Makapu is an arid place with very little mud draining into the ocean. Sounds like a really nice area to lay out at. Brad- people exercise by taking a hike uphill to the lighthouse which offers a view of Molokai and Maui neighbor islands. An even more amazing sight is from road level, where if the wind is just right, paragliders suspend themselves stationary 200-ft. in the air an arm's reach away from the roadway's safety wall.